GOOD Magazine chooses Ms. Megan! We are excited to announce that Megan Nordoff, of Montessori of Mount Pleasant, has been selected as a finalist for GOOD Magazine’s Innovative Teacher Award. You already know Ms. Megan’s commitment advocating for innovation during the first stage of development and her support in ensuring that children reach their fullest potential across all planes of development. We now have an opportunity to share our work on a larger platform- and we are asking for your help. We’ll be making announcement regarding voting and updates on Megan’s status via this social media outlet. We will also send out general information via email and Google Group. * Highlight progressive models of education including MONTESSORI, RIE (www.rie.org), ORTON GILLINGHAM, Richard Louv’s Nature Education, Slow Food, Agriculture and Gardening to early literacy, Reggio inspired environments and more! * Show the nation that there’s more to the Charleston community then a happening tourist destination- it’s a wonderful place to live and raise your children! What will we do if we win the 10K grant? We have an idea concept in place for a MOBILE FARM CLASSROOM modeled after the Montessori (Grammar) Farm built to a Tiny House scale. The 10K will get this project off the ground. It is our intent to build “sister-school” relationships outside the walls of our facility and extend the mobile farm classroom to other South Carolinian schools. If you are interested in participating as a sponsor with the design of this GOODInnovation Idea, we are very happy to welcome your efforts and contributions. 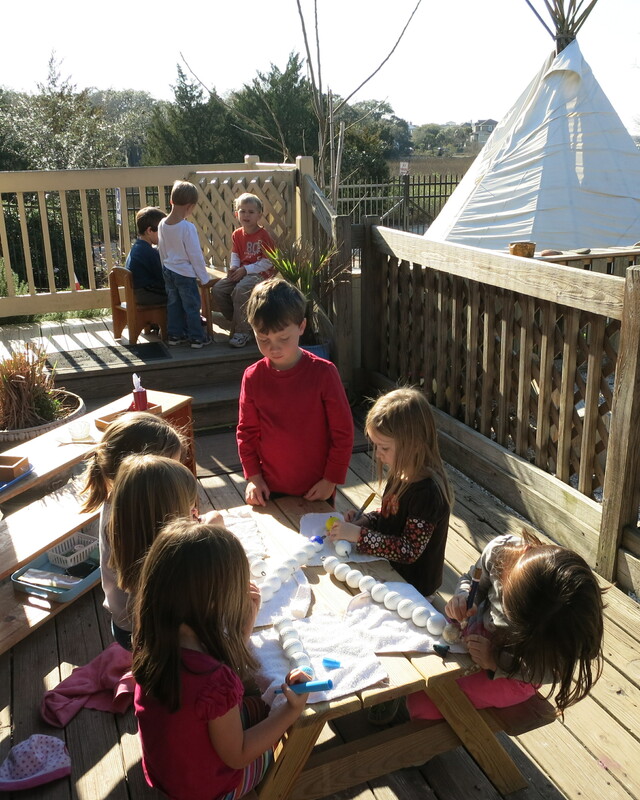 The construction of the large bead stair began as a problem to be solved in our outdoor classroom. 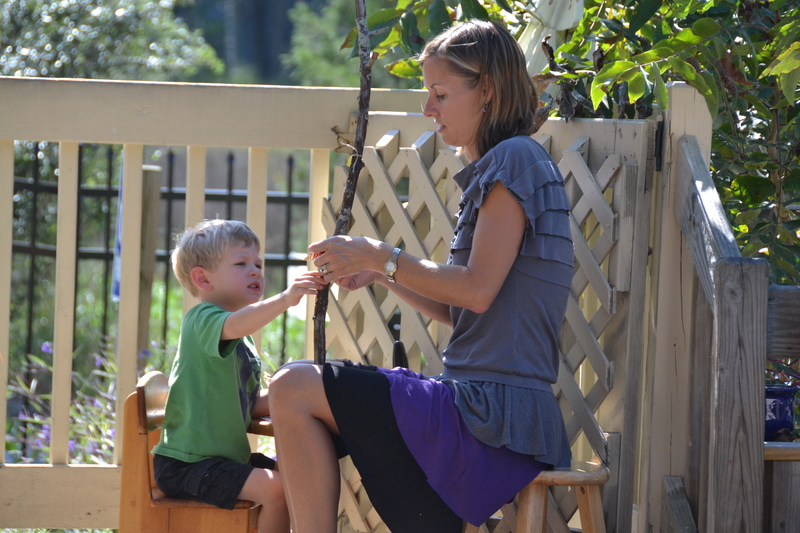 Each morning the children help open and set up the cognitive materials on the porch. 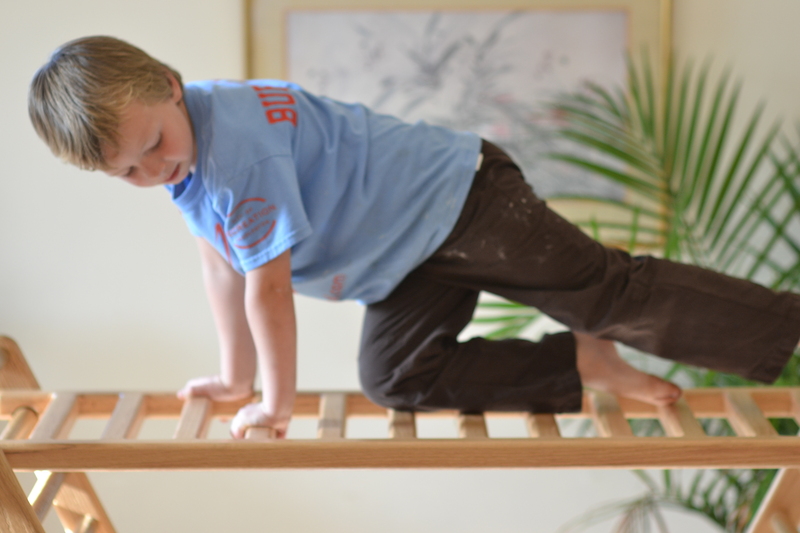 The Montessori bead stair is a quintessential math material which helps with one to one correspondence, links quantity to symbol and is used in higher end math materials, such as the teen boards, short and long chains, and operations. Day after day pieces of the bead stair would get accidently dropped through the floor slats of the porch. As a result, much of our time in the morning was spent replacing the missing beads. One day a child remarked, “Oh! I wish these beads were not so small!” We started brainstorming a weather-proof, porch-proof bead stair. It would need to be inexpensive and involve the children as much as possible in its construction. We also wanted it to highlight the small Montessori bead stair located inside in the classroom rather than take its place. 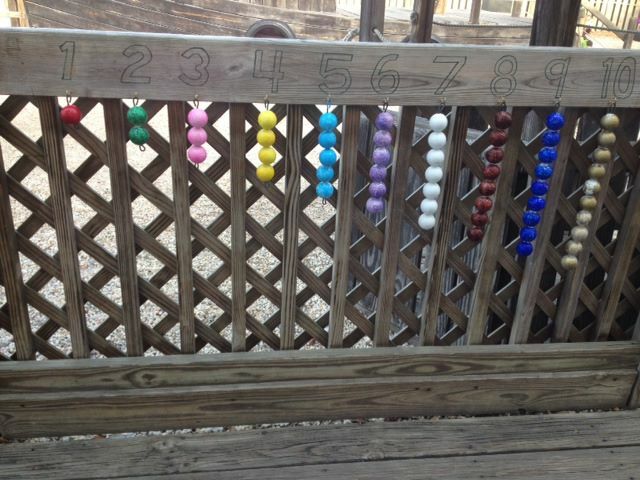 It has been a beautiful point of interest for both the Toddler and Primary children as they walk by the material on the way to the playground and a valued addition to our math curriculum for the outside classroom. 4. Bend a loop at each end and thread golf balls onto wires. 5. 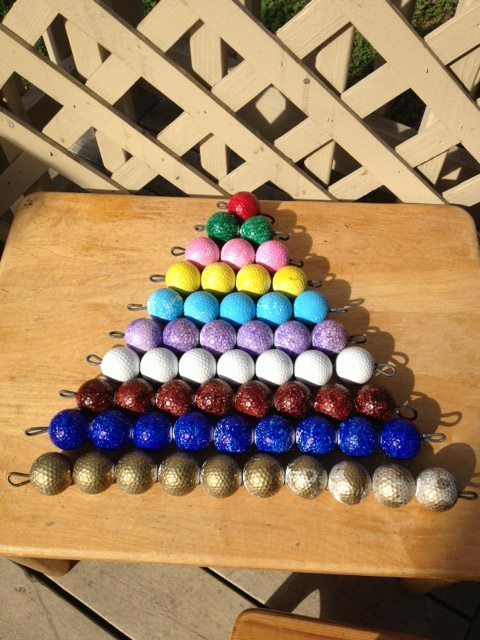 Add color to golf balls to match the small bead stair. Once the tools came out the boys were all ready and willing to help!…drill the holes, cut the wire, and string the balls on in 1-10 sequence. When we were ready to add color, the girls arrived and organized themselves to apply color to the balls to match the small bead stair. 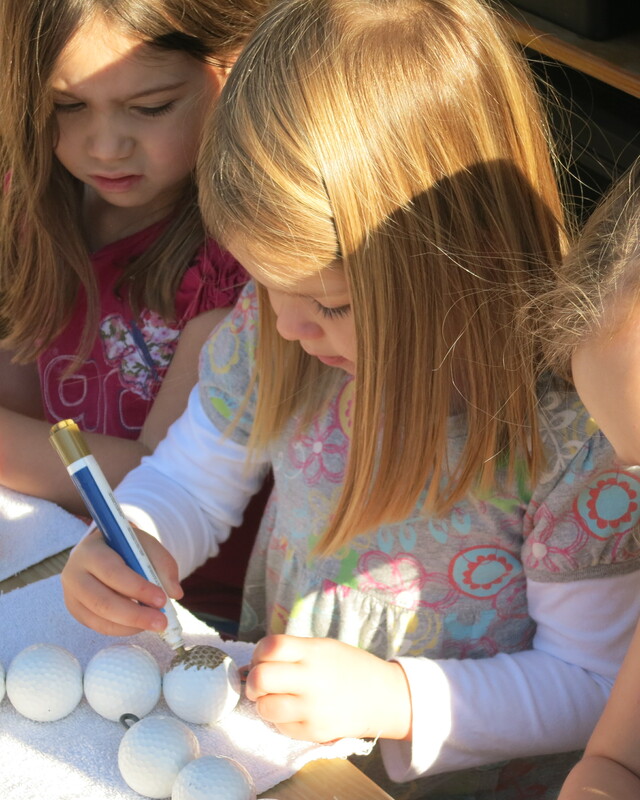 Kindergarteners checked in periodically to supervise and make suggestions (they have been working with the bead stair for years and are well-versed in managing others and chiming in with their expertise at this point in the year)…..
…and voila! We finished and presented the large bead stair as complete and available to use! It has shown to be quite inviting and enticing due to its appearance and location. It has even called to young children who do not have a developed pincer grip yet but who are able to exercise a 4-finger grasp and strengthen their one to one correspondence. As a larger indirect benefit, we have watched the primary children pass by and comment (as they always do after community projects) that they helped make that!